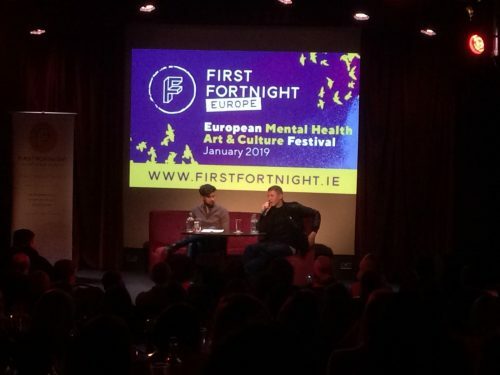 Award winning musician, rapper, and mental health advocate Professor Green (Stephen Manderson) spoke with 2FM presenter, broadcaster Eoghan Mc Dermott as part of the First Fortnight festival in the Sugar Club last Saturday 19th January. Professor Green, or ‘Pro Green’ as he is also known, spoke about his own experience with mental health difficulties, how it has affected his career and creative output, and the impact his fathers suicide has had on his life, creating a willingness to open up about his vulnerabilities and create awareness on these important topics. An advocate for several campaigns on mental health awareness he has touched on various topics including depression, male suicide, poverty, and other challenges facing the vulnerable in society. He is a patron for the charity CALM (Campaign Against Living Miserably) and has made a documentary series for the BBC including: Suicide & Me (2015), Hidden and Homeless (2016), and Living in Poverty (2017) . 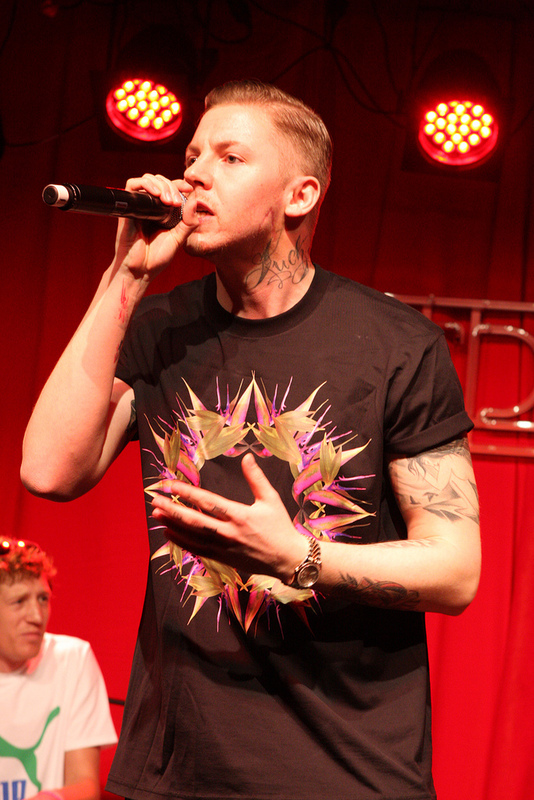 In November 2016 Professor Green received the MIND Making a Difference National Award rewarding his dedication to campaigning about men’s mental health through his documentaries, music, autobiography and media work. Stephen Manderson grew up in Hackney, East London, with his grandmother as his legal guardian after his mother, who had him at 16, left when he was 1. Early life was chaotic, with six people living in a 3-bedroom flat. His relationship with school was turbulent, he went to three different primary schools, had poor attendance at high school and was ultimately expelled. Education wasn’t encouraged or pushed on the young musician, despite an opportunity to attend the prestigeous boys’ private school St Paul’s in North London, “I knew my place in society”, he explained. At the age of 18 he started rapping and despite the growth of his fame his anxiety and depression continued to affect him, “I had a few more bad days than good ones.” As a ‘person of interest’ he felt that his wasn’t allowed to complain and struggled to open up about his difficulties. One of the biggest turning point for Pro Green was the death of his father by suicide when he was 24. He stopped using all recreational drugs, “I wanted to feel how I felt, I needed to process it.” Throughout his life his relationship with his father was “very disfunctional” and “toxic”, and despite attempts to salvage the relationship, Green decided to distance himself from him in favour of self preservation. “I’d only understand him if I got to the place he was in before he took his own life but realised I didn’t want to be in that place, so instead I made a documentary called Suicide and Me. Originally the documentary was supposed to be about male mental health, but it became something more for Pro Green who for the first time opened up to showing his vulnerabilities, something he feared but understood was necessary in order to make change and challenge stigma. His father’s death was not the only psychological bump in his life, the rapper was stabbed in the neck with a broken bottle in a nightclub in 2009. His attacker, Anthony Jones, was jailed for eight years. Four years later, his leg was crushed between two parked cars outside his home when a driver accidentally put his foot on the accelerator leaving him with a compression fracture and snapped ligament. This accident, he said, was emotionally and physically debilitating and plunged him into depression. “I was on anti depressants and they helped me but I’m off them now. There are other things you can do.” he said. Presenter Eoghan, pointed out the importance to distinguish the difference between what you can do for mental wellness, and medication and a diagnosis for people with life long debilitating mental illness to which Pro Green agreed.